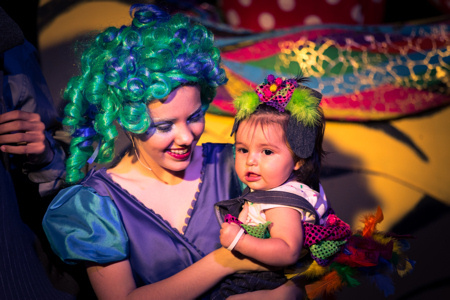 The Studio 3 group took us on one of the most inventive and memorable trips through the land of Dr. Seuss in a show that enchanted from beginning to end. Emma England and Marie South teamed up to both direct and choreograph the show, doing so with great insight and attention to detail. 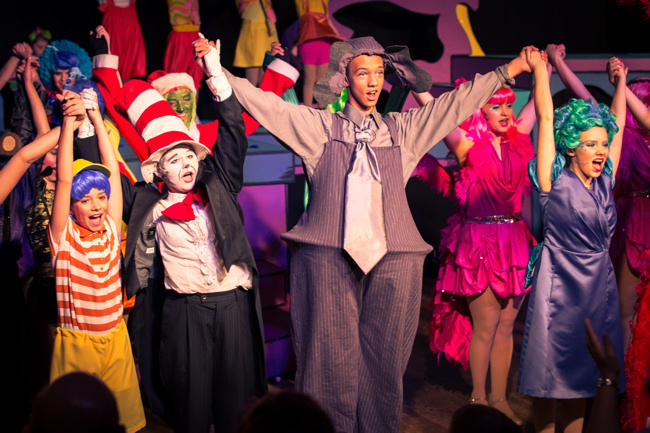 Their intimate Studio 3 space in Gilbert is transformed with some well-placed classical Seussical scenery pieces that include curtained holes from which characters can crawl in and out of (although the characters can also come in from behind the audience, as Faith Sterling a.k.a. 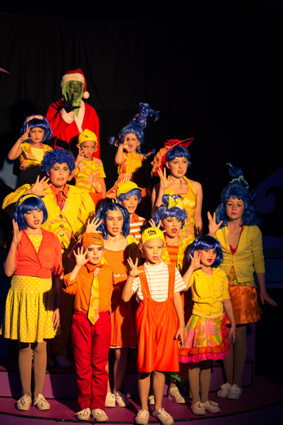 The Grinch does to successfully sneak up behind and amusingly frighten an audience member). And all those characters draw us in to their world right from the top with a charismatic and well-choreographed Oh the Thinks You Can Think. 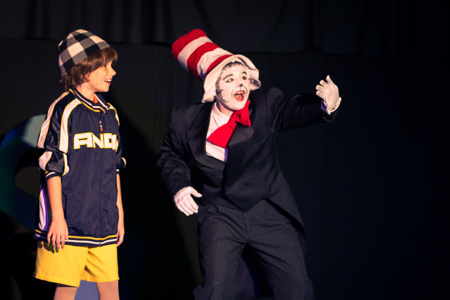 Guiding us along is thirteen-year-old Anna Iverson as the Cat in the Hat, using her voice to great effect including simulated underwater singing while coming up from behind the bathtub in McElligot�s Pool, playing the fake piano right past the keys, and with a fun and mischievous personality throughout. We see the world through young Jojo�s eyes, and remarkably talented fourth grader Olivia Woodward-Shaw provides those excited eyes brimming with wonder and imagination, into every moment of her journey through the new universe she�s dreamed up. 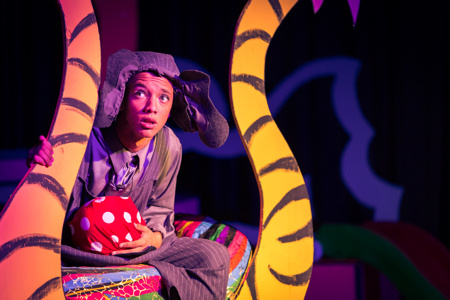 A universe she shares with our hero, Savoy Thompson, as a loyal, sensitive, and entertaining Horton the Elephant. Such a nice guy that his neighbor Gertrude has completely fallen in love with him. 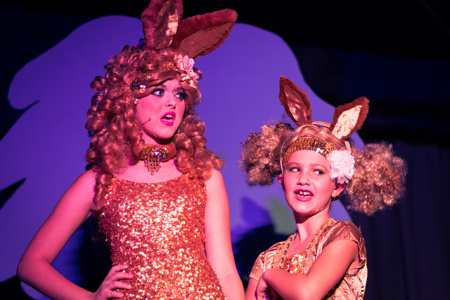 Emily Woodward-Shaw is amazing in the role � a young Judy Garland with brilliant use of voice and a natural knack for comedy as she pivots between sweet and charming (including gaga eyes whenever Horton defends the whos at trial) and Exorcist-like as she craves the bigger tail in hopes of getting Horton�s attention. The cast is dynamite from top to bottom, including Katie Doty as the funny and vain Mayzie with terrific vocals, Angelina Cappellano knocking it out as the Sour Kangaroo with her voice and attitude, Kayla King as a happy-go-lucky Pillberry Bush who grows increasingly uncomfortable by an obsessed Gertrude, some tough Wickersham Brothers (Belemi Thompson, Makalo Thompson, and Rebecca Webb), and the whimsical Bird Girls (Kaitlyn Brecker, Gillian Elliot, Kaleigh Feuerstein, and Megan Longton) narrating with style. 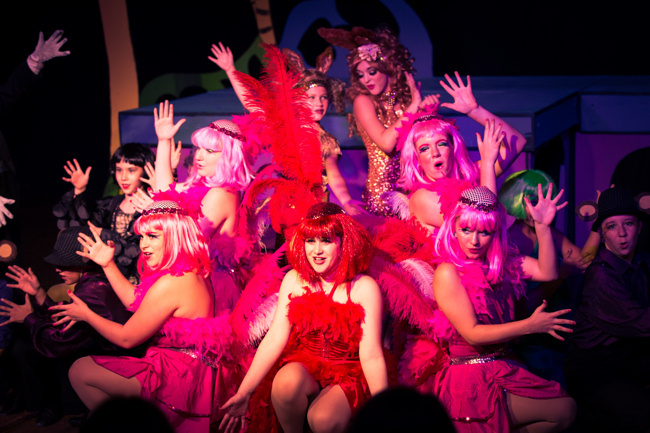 While the ensemble of whos and jungle animals are each individually into it and their various personalities, impressing with their dancing, acting and singing from the big opening number to the inspiring closing.